the chicken, stirring until coated. Marinate for 10 minutes. 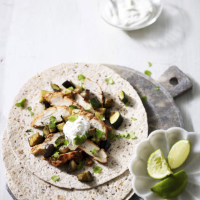 sliced chicken and extra yoghurt, then sprinkle with fresh coriander and serve with extra lime wedges. This can also be made with halloumi for a meat-free version. Simply use in place of the chicken and griddle for 2 minutes on each side.